In vedic system, animal sacrifices are classified into two categories. 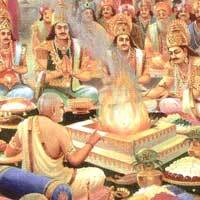 First category is for testing the efficacy of mantras chanted in a fire sacrifice. Under this system, an old animal is sacrificed and by the power of mantras, it is revived back into a young, healthy animal and the process is completely painless. This rejuvenation, if carried out successfully, determines the accuracy of the chants and successful completion of the fire sacrifice. Vedas prohibit such animal sacrifices in modern times as it is not possible to revive dead animals anymore due to a lack of qualified priests. The second type of animal sacrifice is a concession for compulsive meat eaters. Lower social classes are enjoined to kill a goat in front of goddess Kali on a dark moon night while chanting mantras which explain the sinful reactions of animal killing. The whole purpose is to contain unrestricted meat eating which is much prevalent in today’s ‘slaughterhouse culture’. Also by such regulation, a meat eater can be brought back to his senses gradually. He can realize the futility of accruing bad karma just for the sake of some meat. This licensing of animal sacrifice by Vedas is like licensing of liquor by the government. The purpose is not to encourage but to regulate and thereby restrict. Vedic literatures are replete with stories of Kings who were hunting animals regularly. Again the purpose of such hunting was two fold. First was to contain the menace of violent animals. This allowed the seers and sages to live peacefully in the forest. They lived there to research, write and pray for the whole human society. Secondly, it honed the fighting skills of the ruling class. This enabled them to protect innocent citizens from enemies and anti-social elements.